er system is obligatory an large rooms or risky areas. 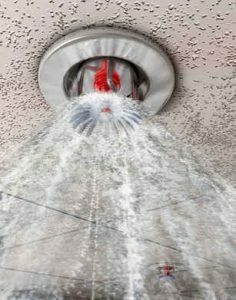 In case of smoke or fire the system should open and prevent serious fire by spraying water. A sprinkler system is the smaller version of a fire fighting system, which is protecting whole plants. Mostly there is a separated pipe system at the ceiling dedicated only for fire fighting. This is filled with water and kept under high pressure all the time in order to react fast in the case of a fire. The water is stagnant and therefore can lead to corrosion and rust in the pipes. In the worst case this corrosion can cause blockages of pipes and sprinkler nozzles. The advantage of a Merus Ring in a pipe system compared to other water treatment methods is, that it also works in stagnating water. As an effect existing corrosion is bounded in the water. In some weeks rust and corrosion is stopped. To support the effect right after the installation the system should be opened and the water exchanged once. Looking the water you will first observe a brown color. After a short time the water is clean and the existing rust is gone. There is no further action needed after the system had been flushed once. For further information concerning corrosion in your pipes please have a look at the case studies where the effect is described more detailed. If you have any questions please don’t hesitate to contact us.